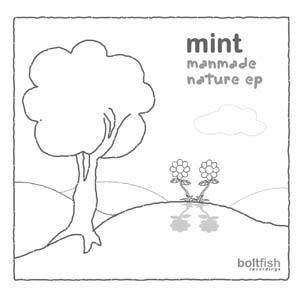 MINT's second EP on Boltfish Recordings, set to round off 2004 as it began with some playful but thoughtful idm. "Four tracks on this EP, Manmade nature... I'll draw your attention to the musical work of this graphic and clothing designer. Definitely, Mint can do many things well, not least music. Manmade Nature EP fits an emotional vein, with languorous beats and warm sounds, that ambient music lovers like to feel pulsate. With traces of the music of 'Deadbeat' in A question of timing, Mint endows his music with a charm as well as a gentle softness to lighten the end of a difficult day. (Mint uses) a little frankness and a bit of naivety, dispensing with superfluity and keeping only essential sound textures, the purified and slow rhythms, organic sonorities, supported with intricate melodies. Manmade Nature EP is simple and basic, but moving and fascinating..."
"Bizarre and unpredictable...abstract and minimalist..this identified flying object expresses the 21st cyber culture at its best!" "The 1st track on the EP has solid beat and assorted layered synthetic sounds in harmony. The 2nd track "Milk" is pure bliss based on feather light beats, clever panning and synthetic sounds washing in like a mild summer rain. All accompanied by a guitar floating around in the background and a vocal sample. Terrific atmosphere and I don’t even like milk. The 3rd track "A question of timing" sets another mood and has hesitant percussions and played bassline to go. The beat takes on house like form and gives the track forward movement, but the bassline never leaves their side. The 4th track "Little Gift" would find it’s place in any nursery and has the sweetest of melodies, but wait their some foreign elements in this nursery song: glitch. Wisely distributed though, wouldn’t want to upset the little ones and yes we get lovely strings too. The conclusion: a nice track and another great release by Mint and Boltfish." ""Standing still" drops a smile rich melody from the very beginning and backs it up with sweeping and eye catching charm that is backed up by a drumbeat that although thudding in its makeup is rhythmic and programmed to the highest degree. The whole track feels like an introduction to a story, with a flyby over the entire landscape that the whole thing will unfold on, pure quality throughout." "Standing Still is killing me slowly killing me. I feel charmed.."
"Mellow electronic label Boltfish continue their stunning form with this latest EP. Opening with ‘Standing Still’ it’s instantly soothing and chilled. Wide-open sound scapes, gentle keys and a sizzling electronica crackle under the surface. ‘Milk’ has a touch of Orbitals ‘Belfast’ to it, simmering moods and relaxing vibes all the way. ‘A question of timing’ and ‘Little Gift’ continue in a similar vein. It’s another fabulous release from Boltfish, turn the lights off a put this beauty on the CD player and drift away into a world of soothing calm." Buy this release digitally, direct from the artist. Digital handling and payments via Bandcamp/Paypal.